"THE SUNDAY TIMES NO. 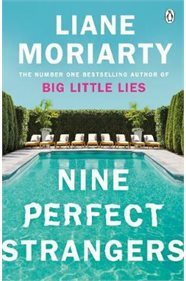 1 BESTSELLER AND RICHARD & JUDY SPRING BOOK CLUB PICK, FROM THE AUTHOR BEHIND AWARD WINNING TV SERIES BIG LITTLE LIES. Nine perfect strangers, each hiding an imperfect life. A luxury retreat cut off from the outside world. Ten days that promise to change your life. But some promises - like some lives - are perfect lies . . . __________ 'Fantastic' Times 'Original, suspenseful, downright brilliant' Clare Mackintosh 'The twist blew my mind' Marian Keyes 'A super-suspenseful page-turner' Mail on Sunday 'Will grip you from the first page' Sunday Express 'Captivating' Good Housekeeping 'Had me utterly hooked' Daily Mail"